Visual artist Liz Cooke trained as a photographer and worked through the 90’s as a freelance artist, photographer and illustrator. After moving to the Isle of Wight, and becoming a mother, Liz was first commissioned to make a set of flags for the Isle of Wight Festival in 2008. A dreamer by nature, Liz sees the creative process as one of fluidity, unbound by any particular medium, and quickly became fascinated at the ability of flags to transform a space into something celebratory and uplifting. Liz loves working with colour, light and movement, and has created hundreds of flags in different sizes and styles since that first commission. 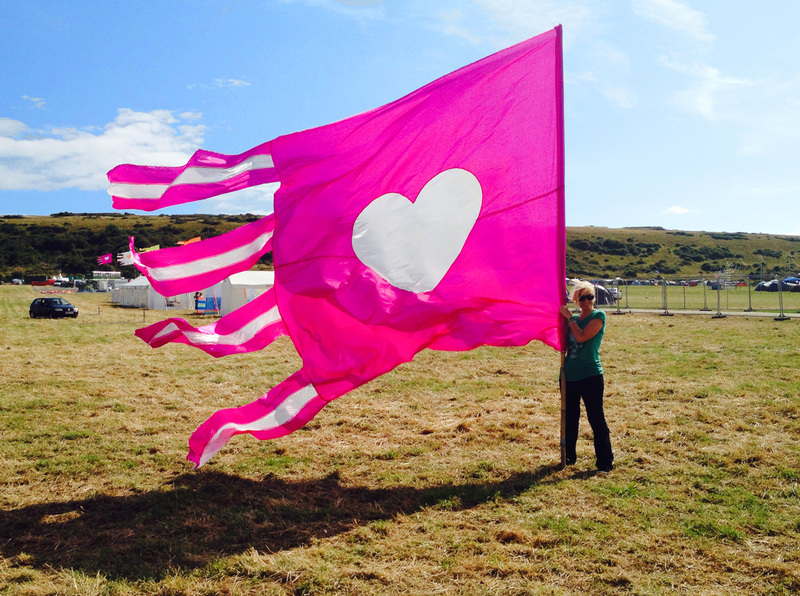 All the flags are designed and made by Liz in her off-grid, solar-powered studio on the Isle of Wight. Inspired by her mediation practice, and the prayer flags she saw flying all over the Himalayas in her visit to Ladakh in the late 90’s, Liz views all her flags as prayer flags. Each one is blessed during the creative process, for the good of all . These blessings that blow on the wind, harness the power of positive intention, and literally and invisibly spread the love! May all beings throughout the Universe be happy.